Home Workouts Leg Workout: 5 Exercises To Build Big Legs ! Leg Workout: 5 Exercises To Build Big Legs ! Pyramid sets work great for building leg strength. Start with a weight that allows you to get around 12 reps with good form, then increase the weight by 20 pounds and perform 8-10 reps. Increase the weight again by adding 20 reps and perform 8 reps, then add another 20 pounds and go for 6 reps. The next set should be the peak of your pyramid – increase the weight by 20 pounds again (by now you’ve added a total of 80 pounds to your starting weight) and aim to get 4-6 reps with as strict form as possible. The hamstring curl is a crucial exercise for ensuring complete balance between the front and the back of the leg, which results with improved aesthetics and a lesser risk of injuries rooted in unbalanced muscle development. 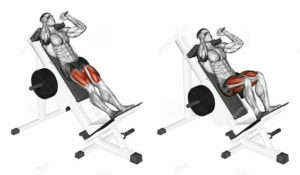 On top of that, leg curls will work your hamstrings more directly than any other exercise. Sadly, hamstring training isn’t as popular as quad training is and this causes many lifters to forget about the importance of complete muscle development and leave their hamstrings underworked and unimpressive-looking. The hamstrings cross two joints – the knee joint and the hip joint – so they need to be trained with the help of exercises that target the knee flexion function and the hip extension function of the hamstring muscle separately. 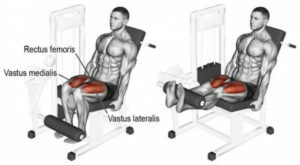 The leg curls, you guessed it, utilize the knee flexion function of the hamstrings. This exercise is best performed in a drop set fashion. Pick a relatively heavy weight and perform 12 reps with good form, then reduce the weight and perform 12 reps again. Drop the weight again and go for 12 reps, then drop it one last time and perform the final set, making sure your form is intact. That’s a total of 4 sets with 12 reps each. Again, aim to maximally exhaust your hamstrings by keeping the muscle tension as intense and constant as possible. The leg extension is a simple, limited movement which occurs only at the knee joint and can be used to strengthen the quads. 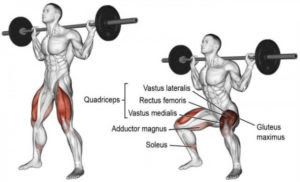 Leg extensions get a lot of bad rep because there seem to be a lot of guys who believe this is the only move they need to build awesome-looking quads and use it as an excuse to neglect superior exercises like squats and deadlifts. 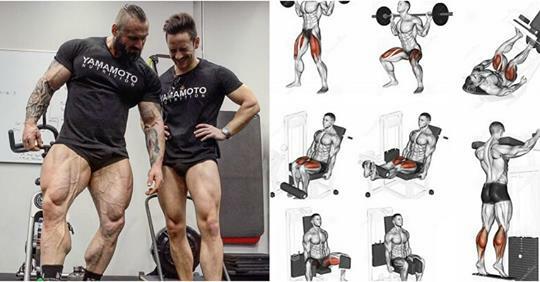 While it’s true that leg extensions aren’t the greatest leg exercise on the planet, it still has a lot of potential to upgrade your leg development as long as you use it just like you would use any other isolation exercise. In this context, leg extensions can and will help you build more muscle, so don’t write them off just yet. In fact, this is a key exercise for strengthening the patellar ligament and the quadriceps attachment for the knee, which is super important for maintaining knee health and improving the results of lower body training. As simple and basic as this exercise is, it’s worth keeping in mind some key form points that will maximize its effectiveness. First of all, you need to adjust the pad so that it falls on top of your lower leg, just above the feet. In addition, make sure that your legs form a 90-degree angle between the lower and upper leg. This will help you avoid placing undue stress on the knee joint. Again, perform a drop set, starting with a weight that’s heavy enough to make you struggle to get 10 good reps, then drop it and perform another 10 reps. Continue in this manner until you complete 4 sets of 10 reps.
By now your legs will be burning like hell, so if you can’t go through a full range of motion on every rep, go for half reps on the last two sets. Using your quads, extend your legs to the maximum while keeping a slight bend in your knees to protect the joint and ensuring that the rest of the body remains stationary on the seat at all times. Hold the peak contraction for a second, then slowly lower the weight back without letting your legs go past the 90-degree limit. To completely drain your leg muscles of any remaining bits of strength, we recommend finishing the workout with a few sets of dumbbell lunges. Lunges are great at engaging your quads and gluteal muscles and can help you improve overall leg definition. But instead of doing forward lunges, you will hold the position for about 30 seconds. Take a dumbbell in each hand and lunge forward with your right leg, keeping your body aligned and abs contracted. Without moving your feet, lower your rear leg until the knee almost touches he floor while bending your front leg. Hold for 30 seconds, then return to the start position and repeat with the other side. Perform 3 sets of 10-15 reps per side. If you feel like you can do more, increase the weight of the dumbbells and make sure that you struggle at every rep towards the end of the set. These 5 exercises make up a great basic leg routine that is guaranteed to help you jump start your leg development. If you start training your legs regularly with this workout, you should be able to see noticeable improvements in terms of size and strength pretty quickly.